What People are saying in 2018 about JenniBakes4U! Blairstown Museum added a new photo to the album: Friends of Blairstown Museum. August 17 at 4:05 PM · Well, well look at those fantastic (and absolutely delicious) cookies! These were gifted to us in July by the ever fabulous Jenni Bakes 4 U. Our delay in posting the photo has everything to do with our busy schedule, and absolutely nothing to do with these delightful cookies. If you have not tried one of Jennifer Wallace's cookies, what are you waiting for? They are amazingly good (and really pretty). Click on the picture to check out this cool Channel on You Tube (Oct 365) - She mentions "pam" the baker -ie: ME - and the fun cookies pictured here she purchased from me at the Friday the 13th Event in Blairstown, NJ. 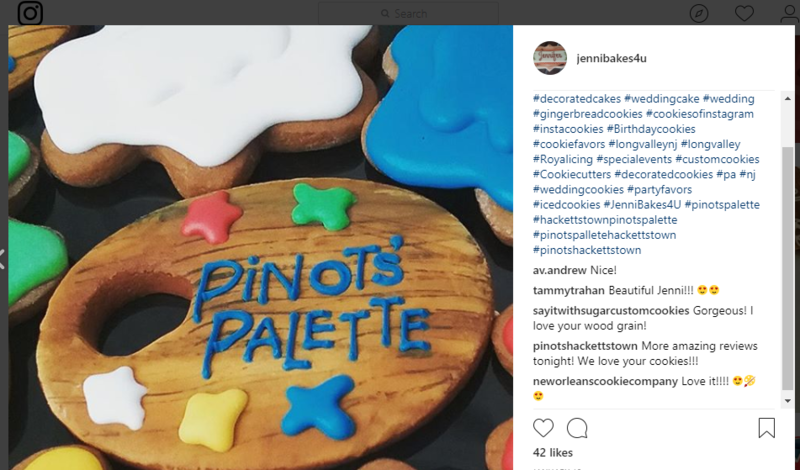 And from Instagram... "We love your cookies!" 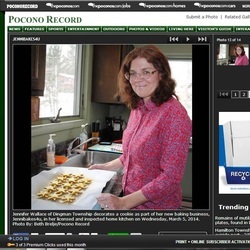 Click on the Picture of the Newspaper to read the full article about JenniBakes4U from back when I received my license as it was recorded in the Pocono Record! Exciting Photo Gallery in the Pocono Record! 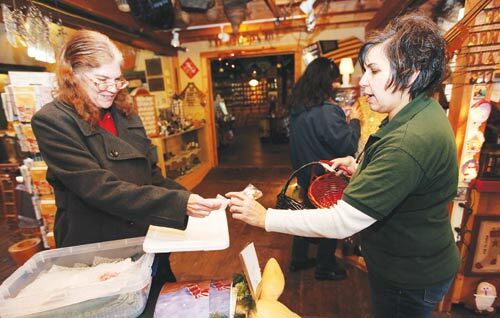 Photos by Tracy Klimek/New Jersey Herald - Lisa Sinert Sartor, right, co-owner of 84 Country Store, stands in her store reaching for a cookie baked by Jennifer Wallace, with Jenny Bake’s, to see if the cookies are an item she would sell in her store. Click to read entire article here. About Gingerbread - Ginger was found to have preservative qualities, Gingerbread was not baked in homes in the 15th century, but rather was made by government-recognized guilds. Nuremberg, Germany was the location of the best known guild. The German guild was famous for elaborately detailing the lebkuchen with gold paint or with icing. The guild was called the Lebkuchner and was formed in 1643 as a means of quality-control reasons as well as a way to limit competition in making the gingerbread. The quality of the Nuremberg guild's lebkuchen was so high that it was even used as currency for paying city taxes. It was also considered a gift worthy of heads of state and royalty. Lebkuchen gingerbread is still sold in Nuremberg today. Gingerbread cut into shapes, especially hearts, and tied with ribbon became a popular treat sold in fairs throughout Europe. Human and animal figures were also popular. The Brothers Grimm fairy tale, Hansel and Gretel, inspired the German "hexenhaeusle," or witch's house. "Lebkuchenhaeusle," the gingerbread house, was made with large slabs of lebkuchen and decorated with sweets. The first gingerbread in the United States is thought to have been brought by Swiss Catholic monks who founded the St. Meinrad Archabbey in Indiana in 1854. Monks gave gingerbread to the sick and baked it for holiday celebrations. Baking cookies and houses to celebrate the Christmas holiday became a tradition in the United States that is still popular today. American bakers often sweeten gingerbread with molasses, while British bakers may use syrup and brown sugar. Germans usually sweeten lebkuchen with honey, which is the traditional sweetener used by the guild in Nuremberg, an area with many forests containing beehives. Aside from ginger, cinnamon is the next most common spice used in gingerbread. Cloves, nutmeg, cardamom, and sometimes anise are other spices commonly found in many recipes. About me - The Baker and decorator! Jennifer Wallace, a Trained Wilton Method Instructor, has been decorating cakes for over 25 years. She is very excited to be able to share her edible works of art with you. 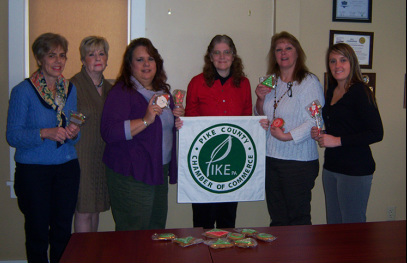 Her kitchen is registered and inspected by the Pennsylvania Department of Agriculture.